Subtitle: Experiencing Great Revvals of the Past, Empowering You for God's Move Today! God is sending another great wave of revival across the world. He is calling us out of our comfort zone to catch this wave of His Spirit’s most powerful move yet. God has not been outdone by a previous generation. The greatest churches are yet to be built. The greatest signs and wonders are yet to be performed. He is saving His best for last! And part of this great move of God is your destiny in His plan for these last days! 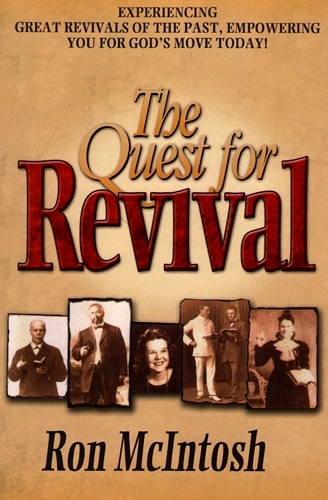 The Quest for Revival reveals the power and perils of great revivals of the past to help springboard you into this next move of the Holy Spirit. Focusing on key scriptural foundations that were at the heart of great revivalists such as Charles Parham, William Seymour, John G. Lake, Smith Wigglesworth, Aimee Semple-McPherson, Kathryn Kuhlman and others, Ron McIntosh reveals the keys to successfully following God’s wave of revival and the deceptions the enemy uses to hinder you. These heroes of the faith have started the fires of revival: it is up to you, as part of this new generation, to keep the flames burning in your quest for revival! Chapter 12: Why Do We Worship? Ron McIntosh and his wife, Judy, live in Tulsa, Oklahoma, with their three sons – David, Daniel, and Jonathan. His ministry has taken him across the country and around the world. With a Master of Divinity degree, Ron has done extensive study on the principles of revival from a historical, scriptural and practical basis. The Quest for Revival is an in-depth examination of the key principles to igniting revival in today’s believers.